A lawsuit that could dramatically change how California public schools deal with ineffective teachers gets underway Monday in a California Superior Court for Los Angeles County, where LA Unified Superintendent John Deasy is expected to be the first witness to testify. 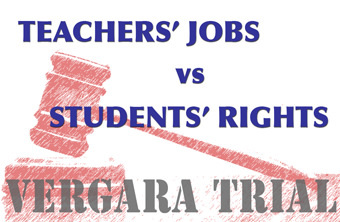 The suit, Vergara v California, has been brought by students who are challenging state laws that they contend protect ineffective teachers. They say the laws deny students their constitutionally protected right to a quality education. One law provides tenure — a guarantee of permanent employment — after 18 months. Three others govern the long and costly process of removing teachers. And a fifth, known as “Last in, first out,” ignores teacher quality in favor of seniority when layoffs are deemed necessary. The defendants are the state, including Gov. Jerry Brown and Superintendent of Public Education Tom Torlakson, as well as the two biggest teachers unions in the state, the California Teachers Association (CTA) and the California Federation of Teachers (CFT). If successful, he said, the suit would make it “more difficult to attract and retain teachers” in public schools. The defendants failed on three attempts to have the case dismissed. “Although we had hoped this would not make it as far as trial, we do see this as an opportunity to show that teachers and laws that protect basic due process, fairness, and the right for employees to be heard are not the problem with California schools,” Frank Wells, a CTA spokesman, said in a statement. “This lawsuit does nothing to address poverty, other social issues, and ongoing lack of social and capital investment in a strong public school system. Both the California Department of Education and the state Attorney General’s office, which represents the defendants at trial, declined to comment. The plaintiffs are claiming that five state laws combine to make it so difficult to remove ineffective teachers from public school classrooms that many children are shortchanged in their pursuit of knowledge. The combined effect of the five regulations, said Marcellus McRae, another of the students’ lawyers, costs school districts hundreds of thousands of dollars through years of legal procedures to remove teachers who are impeding academic development. The judge in the case, Rolf M. Treu, has scheduled 20 days for the trial. He, alone, will determine the outcome. The plaintiffs have given him a list of 82 potential witnesses, including LA Unified board member Monica Garcia; the state’s list includes 60, and the unions have listed 102, including LA Unified board member Steve Zimmer. Deasy and other potential witnesses are named on lists for both sides. The lawsuit is sponsored by StudentsMatter, a non-profit organization that promotes access to equality in public education. The case is one of several efforts to amend or change laws governing teachers in the state. Students First, a group founded by Michelle Rhee, the former chancellor of public schools in Washington, is gathering support for a ballot initiative that would accomplish some of the Vergara case’s same goals, and EdVoice, a nonprofit, is doing the same for an initiative that would ease rules in firing teachers accused of serious misconduct. Previous Posts: A California court cleared the way for the ‘Vergara‘ trial to begin; Lawyers for ‘Bad Teacher’ defendants to ask court for dismissal; Olson Previews Arguments in Vergara ‘Bad Teacher’ Lawsuit.